Stumbling off a Murray River Cruise in Echuca’s historic port area, it’s not hard to miss Wistaria. The 100-year-old historic house, now a cafe, is surrounded by a lovely garden that would be extra beautiful in spring and summer. I find myself in a seating dilemma: should I sit in the garden or maybe in one of the cosy rooms? Instead I opt for a table, or should I say an old Singer sewing machine table on the wrap around verandah. The scones are soft and fluffy, perfect for lashing on the jam and thick cream. Watch yesteryear go by along the historic Esplanade. Tea: Loose-leaf and a few herbal tea varieties available. The Alpine Gate Cafe feels like it’s the central hub in Myrtleford. It’s attached to the Visitor’s Centre, so already has a steady stream of potential customers filing past the scones. It’s seriously buzzing inside and I can barely hear myself think. So I brave the wintersun and find a sunny spot in the dining area out the front so I can watch the Myrtleford world go by. And that it does. Passing traffic head up to Bright and further up to the Victorian Alps in search of white gold during the winter months, and mountain biking and hiking in summer. Myrtleford is definitely a pit stop town with the loos across the road in the park, well utilised. I’m here for the scones and although they are a bit soggy from a blast in the microwave, they are still damn good! Smooth and creamy, these scones live up to their reputation on the Internet streets. Being served a disproportionate amount of jam and cream, is a pet hate of mine, as often scones are left high dry. In this instance I barely have enough of the rich tart berry compote style of jam for one scone, but more than enough of the thickly whipped cream. Go figure! Tea: A small range of loose-leaf teas served in a pot. Overall: An ideal pit stop for refeulling. Veer off the Hume Highway in northern Victoria and you won’t be far away from a country town ready for exploration. First in this northern Victorian series is Benalla. It has a bakery that boasts they have the best vanilla slice this side of Kansas. I guess it’s subjective as I find them small and they taste no different from other good vanilla slices. The centrepiece of the town is the Botanical Gardens that wrap around part of Lake Benalla, which on this summer’s morning sees a small group of swimmers doing a circuit of the lake. Sitting on the deck of the Benalla Gallery Cafe, I have pole position of said swimmers. Sharing the building with the Benalla Art Gallery, the cafe seems like a favourite as locals pile in not long after opening time. It’s barely past 8am and there’s a batch of scones on the counter. I assume they are at least yesterday’s as they are dry and unappetising, even on an empty stomach. The jam is stock standard strawberry and the cream luxuriously double thick. Tea: A basic selection of loose-leaf Temple Tea served in a small teapot. Overall: Great location overlooking Lake Benalla. Albury/Wodonga, two border towns jostling for recognition on either side of the Murray River, act like sentinels on the NSW/Victorian border. As far as border towns go, to me, Wodonga is the quieter of the two, keeping a low profile. But why? Wodonga is the gateway to Victoria’s wonderful northeast and Alpine region, as well as the High Country Rail Trail and the interesting Bonegilla Migrant Experience. En route to these attractions stop at the Wondonga Plant Farm for a cuppa at the Garden Gallery Cafe. The spacious cafe with its indoor/outdoor dining looks over pallets of plants and has a kid’s playground out the back. If the sun is shining, sit out under the umbrellas and inhale the scent of blooming flowers and the general plant nursery vibe. On this particular day, the scone looks on the anaemic side but is super fresh and has a creamy texture. The bottom is slightly mushy from heating, but I let it pass, as it’s so delicious. The jam is average and the dollop of double thick cream needs some refrigeration, but overall, it’s a nice spread. Maybe take home a plant or something for the garden. Tea: A selection of T2 loose-leaf teas served in a good-sized pot. Overall: A chilled vibe overlooking out over the nursery. Once you get your tongue around the pronunciation of ‘Yakandandah’, the rest is easy. The gorgeous town is heaving with cute historic homes and although the main street has been reclaimed and refurbished for the 21st century, it still retains an essence of yesteryear when Yakandandah was at its goldrush peak in the 1870s. I step into Java@Yack and come face-to-face with a dressed mannequin sitting at a table – odd. The cafe feels like an unpretentious locals hangout, there are even a couple of shelves crammed with DVD rentals in the corner. I notice the business is for sale, and I can only surmise that the older couple is ready to hang up their aprons and enjoy retirement! The two bit-size scones are served a tad cooler than room temperature, no blast in the microwave for these babies, which is the exception rather than the norm in Australia. The scones arrive already dressed with jam and cream, but I don’t mind. Maybe it’s because the slightly sweet cream is chilled and firm – nice one. Even though there’s quite a lot of cream, it still doesn’t disguise the lousy quality of the jam. Tea: An array of different branded tea bags (from Planet Organic to Lipton) served in a small pot, with an extra pot of water and a pair of tongs to remove the tea bag – love it! The Winton Wetlands has a fascinating back story. Once known as Winton (Mokoan) Swamp, it was flooded in 1971 to create Lake Mokoan, which then became popular with the locals for recreation (fishing, sailing), and the farmers for irrigation. Sometimes the lake dried out, and at other times it was subject to blue-green algae outbreaks So those in charge decided it wasn’t worth the hassle, and not without strong local opposition, it was decommissioned and drained in 2010. Nowadays the unique wetland is finding its own rhythm with sections with walking/cycling paths, camping, and a welcoming visitors centre/cafe, Mokoan Hub and Cafe. The view of the wetlands from the Hub (use the complimentary binoculars) is of 150-odd-thousand river red gums that were lost in the flooding, and have now emerged as ghosts of their former selves. As it’s early at the Hub, the scones are exceptionally fresh and fluffy and have a creamy texture. They are large enough that I only need to order one, which is a shame as these a worth filling up on. The raspberry jam is rich and fruity, and it rarely gets better than this. The cream is thickly whipped and there’s enough of both to cover the scone generously. It’s good to know that every dollar spent at the cafe supports cafe operation and ongoing site restoration of the Winton Wetlands habitat. Tea: A basic range of loose-leaf teas served in a small teapot. Overall: A fascinating and beautiful wetlands that feels like it’s in the middle of nowhere. Moment and Memories Tea Room is the kind of place where Devonshire Tea memories are made. It’s all pink and white decor, linen table cloths, proper napkins, and china tea sets. Ideal for groups, the large round tables, and the smaller more intimate tables, take up most of the floorspace, while the walls are lined with teapot and tea ware collections as well as tea, tea cosies, teapots, tea sets, and cake stands that are for sale. From the extensive tea menu, at least a quarter of what’s available are already packaged up and ready to go if you want to take some home, and the same goes for the homemade jams. The standard Devonshire Tea comes with a plain and sultana scone, but there are others such as date, and apricot and almond to choose from, but those with a savoury palate may prefer the pumpkin. My plain scone rates a perfect score; crisp, creamy and fluffy, all rolled into one. The sultana is up there but is a bit tough on the bottom and doesn’t taste as fresh. There’s a fabulous choice of housemade jams, with raspberry, blackberry, strawberry, and apricot on offer, and also others made from seasonal fruit. I have the blackberry, but it tastes as those it has crystallised, which is a shame as it looks rich and fruity, especially in the jam jars that are for sale, instead its akin to eating sugar cubes. The cream is of course double thick, and plenty of it. The Tea Room is open Wednesday to Sunday, but probably give them a call in case there is a function on. Tea: 61 varieties of loose-leaf teas from Melbourne outfit, Tea Leaves. Served in a transparent pot so you can watch the brewing the process. Overall: Quaint – the quintessential tea room. A former gold mining town, Rutherglen now sits smack bang in the middle of award-wining wine country. Easily accessible, it’s just over the border from New South Wales, therefore handy to the Murray River and Albury/Wodonga, and easy enough for a diversion off the Hume Highway. The town centre is lined with mid 19th century heritage buildings, which is typical of many towns in country Victoria. Pickers Cafe & Collectables is down one end of Main St. Look for a few umbrellas and tables set up out front for fine weather dining, and there are several more inside amongst the collectables. Although the scones are large you may not be able to stop at one. They are oven fresh and slightly crispy on the outside. The rich raspberry jam is excellent, and the divine double thick Chantilly style cream has just the right amount of vanilla bean folded through it. While waiting, be sure to check out the second-hand goods and vintage collectables. Closed midweek. Tea: A basic range of Diplomat tea bags served in a decent-sized teapot. Overall: Quality food at great prices. If you’re on two wheels riding the Murray to Mountains Rail Trail then you will pass through the small village of Porepunkah. There’s not much to the place, a few shops, a pub, and a caravan park – but it’s the kind of place you want to stay in for a tranquil break. The Great Alpine Produce & Trading offers a bunch of services all rolled into one, including the cafe, Punkah Pantry. While I sample the scones, a couple of locals arrive for an after work beer and tell me they are boycotting the local pub – something about the new renovations and no public bar. There are bikes to hire, and a vast range of mostly locally produced/made food and giftware. Actually all the wines, beers and ciders are produced within a 50 kilometre radius of the store, and the produce such as honey, tea, berries, trout and salmon etc., are all sourced in Victoria’s north-east. Not bad! Pull up at a barrel outside or sit at the window to watch tranquility pass by, or better still, browse the through the shop. I didn’t know that they grew green tea in north-eastern Victoria? My scones arrive slightly soggy from being heated up in the microwave, which is a shame, but are still better than average. There’s a small amount of mediocre strawberry jam and about four times the amount of thickly whipped cream. I don’t mind having loads of cream, but seriously, balance it out a tad! Tea: A small selection of Tea Drop pyramid tea bags served in a teapot. Overall: Handy location on the Murray to Mountains Rail Trail. The view from the deck of the Red Stag Restaurant is probably the best in the Ovens Valley. In the distance are the snowy peaks of the Victorian Alps, and in the valley below a lake sits amongst lush meadows dotted with deer. Most people come to the Red Stag Deer and Emu Farm for the up-close-and-personal experience with the animals, but stay for the awesome view, and the feeling of being on top of the world. I find it fascinating staring into the brown eyes of a deer, and wondering how he withstands the weight of those magnificent antlers. There are also emus, ostriches, and sheep, plus a variety of hens scrounging around the carpark – the kids will love it. The extensive restaurant makes use of its location perched over the valley, so sit on the deck if you can and take advantage of the view. The DT is slightly untraditional with one massive scone that could be mistaken for a bread roll. It tastes like it’s made from a packet mix, but maybe that’s the sweetness talking. Don’t get me wrong; it’s still a worthy choice. There’s plenty of the berry compote-style jam and thickly whipped cream, which is perfect considering the size of the scone. Tea: Some Tea Tonic loose-leaf teas and a drawer full of boxes of tea bags, so you are sure to find something. The tea is served in a tall glass – odd. Overall: Go for the location, and the animals. Could the high scoring on this review reflect the fact that I had just ridden 40km of the Murray to Mountains Rail trail? Built in the ’90s, the Rail Trail connects Wangaratta and Bright with 87km of bitumen for bicycles. I’ve done a round trip from Bright, taking a small diversion from town before starting on the trail. A gorgeous alpine town, Bright blossoms in the summer months when hikers and bikers come to town. I sit on the sunny deck of the aptly named River Deck Cafe, which adjoins the Visitors Centre. Overlooking Centenary Park and the fast flowing Ovens River, which is still at least 100m away, River Deck Cafe is the ideal rest and refuel stop. I don’t get here until after 3pm, and my scone is amazingly fresh – I can’t believe it! It’s creamy and smooth and I assure myself that it’s not the bike ride that’s clouding my judgment. The housemade mixed berry jam is a mix between a compote and rich jam that errs on the tart side. The chilled double thick cream is firm and spreads thickly. This winning combination is so good that I could eat my way through several scones. Tea: A small range of T2 loose-leaf teas served in a pot. Overall: Handy location with a sensational outlook to the park and river. The gold rush in the late 1850s attracted miners and all sorts of shady characters to Chiltern. The town’s heyday lasted until the early 1900s when the gold deposits dried up, causing a mass exodus, leaving behind an architecturally rich town on the Melbourne to Albury train line, as well as the road linking Sydney and Melbourne. The buildings, most lovingly restored, are still there, and so is the train line, but the Hume Freeway’s buzz is kept well away from the sleepy town. The Old Chiltern Bank is one such well-preserved building from this era. It’s beautifully kept by owner Marcia, and trades as a BnB and Teahouse. The outdoor seating area in the garden is a delight in warmer weather, and indoors, the high vaulted ceiling in the dining area is set up for tea. I’m excited when everything arrives on vintage crockery, including said bone China tea cup (I sit in the garden). The two small scones are at room temperature, which is fine, but are on the dry side. Reviews on Tripadvisor suggest that the jam is homemade. To me, on this day, it is super thick, sliceable even, reminding of the type I had from a can as a child. I make my own jam, and this doesn’t seem like homemade jam – but I could be wrong. It’s a warm day, and the whipped cream isn’t chilled and is struggling to remain intact. It’s a good place to stock up on Adore tea, jam, chutney and crafts made by local ladies. Tea: An amazing choice of Adore loose-leaf teas served in a big teapot. Overall: A gorgeous historic property with a matching menu offering homemade goodies. Entering Glenrowan from the north, The Vintage Hall Cafe is the first commercial venture in a town that eats and breathes all things Ned Kelly. If for some reason you’ve no idea who the infamous bushranger was, you’ll surely leave town with a fairly good idea. The Vintage Hall Cafe is actually part of the old village hall that now acts as a vintage and collectibles shop. The attached cafe has recently had a large deck built out the front that continues to wrap around the front of the hall. This added to the indoor dining, doubles the seating, and makes for a pleasant place to sit in fine weather. There’s a stash of both date and plain scones in the cake cabinet. Even though they err to the small side, I decide on just the plain scone. It’s not great as it’s spent too much time in the microwave and is a bit soggy. The berry jam is the highlight, rich and fruity and an excellent commercial variety. The cream on the other hand, although fresh is very light and airy. Tea: A basic range of tea bags served in a small teapot. Overall: It’s all about vintage wares and a meal rather than Ned Kelly. Maldon is a gem; an authentic historic gold mining town with its fair share of antique shops and old architecture to admire. We wander around one afternoon and although many of the shops are shutting up we find the Berryman’s Cafe & Tea Rooms and pull up a sunny seat on the footpath. The cotton lace tablecloth sets the scene for some crusty scones and thick cream. The scones are fairly large and would have tasted better with a bigger serving of jam and cream. Would love to do an overnight visit in the town as just love the vibe. 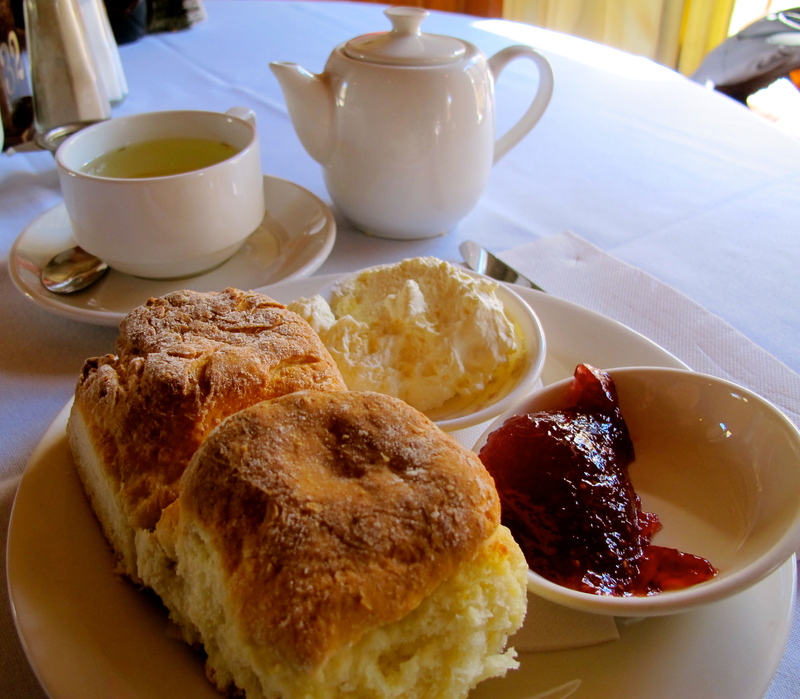 I didn’t know what to expect in the Devonshire Tea stakes at the tourist attraction of Sovereign Hill. 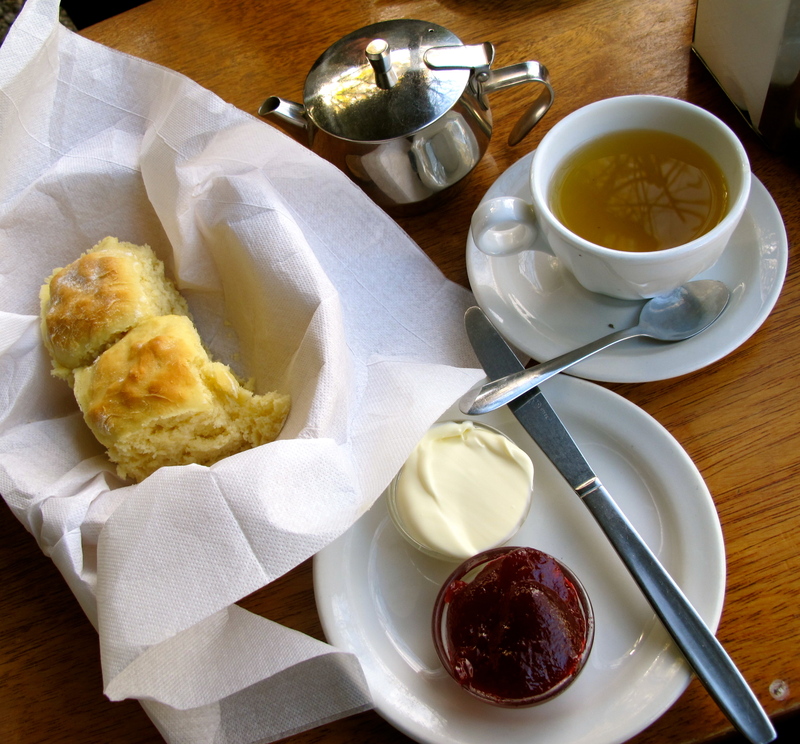 Situated on the old gold diggings of Ballarat, the open-air museum offers an assortment of dining options and I managed to find scones on the menu at the New York Bakery. It’s fairly empty when I visit which gives the cavernous Victorian-era space devoid of atmosphere, but it’s obviously designed for large groups by the looks of the size of the round tables. Waitresses in period dress float amongst the circles of guests, or in this case, the empty tables to deliver my scones. They’re a little highly priced considering the quality, which overall is fairly low. The scones are large and tasteless with not enough jam and cream to go around. The cream is too light and the jam less than extraordinary. Otherwise enjoy the reconstructed history of one of Australia’s biggest gold rushes. Tea: Small pot of loose-leaf variety. Overall: Big and just a little bit contrived. Thanks for that, yes, it’s lovely there. The cafe has changed names from Lighthouse Stables and Tea Rooms to Willows Tea House. Wow! Jindivick? I have never heard of it! Thank you, I’ve added it to my list. 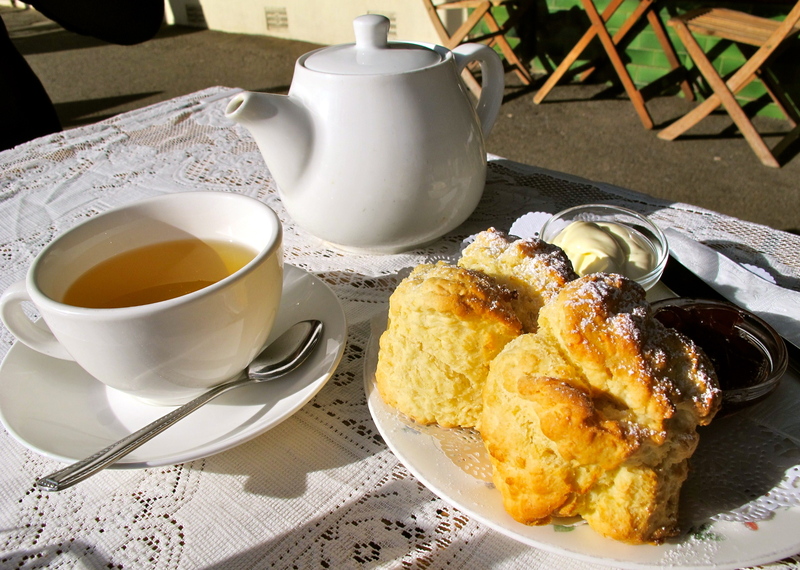 Next time you are passing try our scones at the famous Bendigo Pottery – plain with jam and fresh cream, date and cheese and herb. Thanks for letting me know! Saves me having to trawl google looking for places to try. I have an evergrowing list of places for Victoria and will need to do a road trip. Will definiteluy drop by if passing through.